Giro Range MIPS Ski/Snowboard Helmet. Comfort and fit are the most important aspect of any ski and snowboard helmet after safety and performance features, and the all new Giro Range MIPS aims to be the best fitting helmet out there. The Range MIPS features a two-piece shell design that expands and contracts with Giro's new Comform Fit Technology allowing you to truly dial in a tailored fit to your head shape like never before with a simple twist of a dial in the back. This new technology provides the best fitting, and sleekest helmet ever designed by Giro. The amazing new fit technology is one thing but safety always comes first for any helmet, and with MIPS, you're provided with one of the best safety measures in the industry. MIPS (Multi-Impact Directional System), is a small liner fitted to the inside of the helmet which helps protect your head from rotational forces and off-angle impacts by allowing the outer shell to move independently before impact forces make their way to your head. Everyone knows a helmet can become a heat trap on those warm, spring days. With Thermostat Control venting, those warm days become a little more cool with an adjustable slide to control the amount of air flowing to the top of your head. Don't worry about goggles fogging up either, Stack Ventilation located at the brow of the helmet help channel that pesky, warm air away from goggles keeping visibility high. MIPS Multi-Directional Impact Protection System. Comform Fit Technology, expandable two-piece shell. Compatible with all Giro goggles. Action Sports Factory only ships first quality merchandise. Items sealed in original packaging will not be opened for inspection but all goggles and sunglasses are inspected to insure first quality of all lenses and frames. 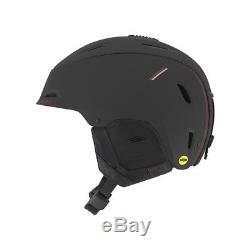 The item "Giro Range MIPS Ski/Snowboard Helmet Matte Black/Red, Medium (55.5cm-59cm)" is in sale since Thursday, November 29, 2018. This item is in the category "Sporting Goods\Winter Sports\Clothing\Protective Gear". The seller is "asfoutdoors" and is located in Concord, New Hampshire.